Hello!! I share with you today a holiday mixed media layout with the gorgeous Carousel Christmas collection and products by BoBunny and Pentart. 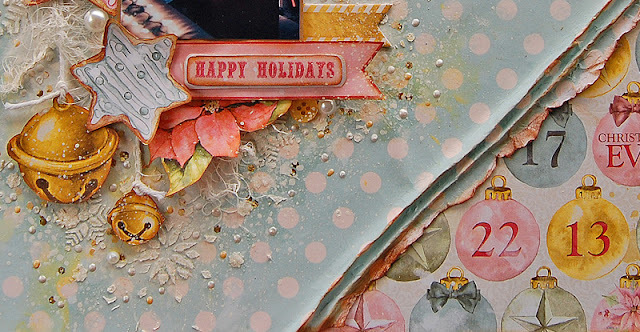 I started giving textures to my base paper (Joy) with the Winter Fun Stickable Stencil and the Sugar Glitter Paste. It created bright snowflakes on the background, then I added white paint splatters. The Joy paper has a few spots of yellow paint, so I created more yellow spots on the background with a mix of Pentart Acrylic Gold paint and Gesso Primer Paste. I used the Happy Holidays as my title and to enhance it, I cut the pink banner from the Floral paper and adhered it behind the quote with foam tape. I draped the Joy paper and place under the believe paper. To make the project more interesting I tied a white cord to the jingle bells. I made some dots with the Pearlecents to create more textures on the background. I applied with a paintbrush the Gold Confetti Paste on the background and added pieces of cheesecloth between the embellishments. 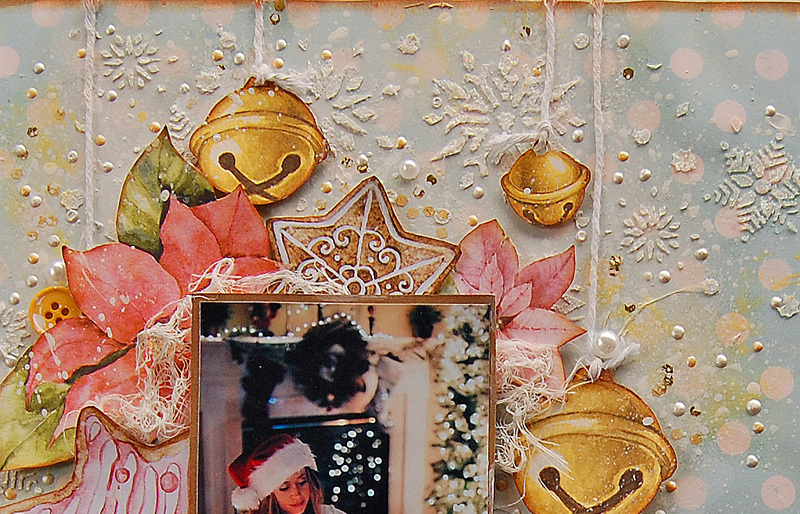 I cut out different images from the Wonder paper that I gave distress ink and added 3D foam tape to create dimension with them. I placed the photo and then I added the different images to create the design on my layout. Finally I added some buttons from the Ephemera package and some pearls. I hope you find some inspiration, Thanks for stopping by...until next time! !